I seem to have a bit of difficulty when printing forms. I embedded it into my Wordpress page, and it looks GREAT! on the screen. 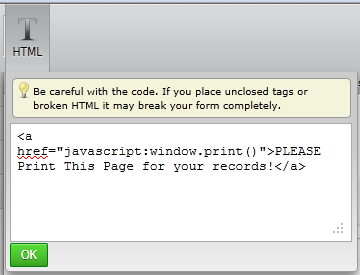 However, when I try to print, it prints all of the page header/menu information and then the form. Also, I had all my fields on one page but it was really too long. So I decided to add page breaks for a better form flow. Well, now when I print (which the button only displays on the very last page) I only get a print out of the same header/menu info and only the data fields that are on the current (last) page. Oh, also, forgot to ask, but is there anyway to show a progress bar or page x of y somewhere so that people filling out a multi-page form know how much more there is? Notify us if you have further questions with regard to this matter. Thank you for using JotForm! @Neil thanks for your answers. Is there any way around the print button also printing all the page menu/header info? I would really like for it to NOT do that. Do you mean the heading field such as in the screenshot below? Sadly, the answer is no. There are no other way to print a form other than calling the browser's print function. Browsers print a page as it is displayed, although it can use a print css to stylize the form for printing purposes. You can create your custom print css but that means that you would also have to use the form's full source code and embed it in a blank page which you'll be embedding as an iFrame on your actual website. To be honest, it can get quite complicated and cumbersome but if you're up for it, I can give you some references to learn it from. If the goal is for them to print the form to fill out later you can also create a PDF of the Form and put that pdf file on the server that hosts your website then link to that form. Please note that I went to http://test.techquility.net/theraganlawfirm.com/forms/new-client-intake-form/# and page 4 has a back button instead of a previous button like the rest...just wanted to mention it.